N. Ahalya, T.V. Ramachandra* l and R.D. Kanamadi 2 1. 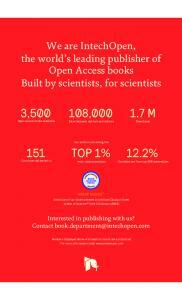 Centre for Ecological Sciences, Indian Institute of Science, Bangalore 560 012, INDIA. 2. Department of Zoology, Karnataka University, Dharwad, INDIA. electrodes causes a migration of cations and anions towards respective electrodes. Because of the alternate spacing of cation and anion permeable membranes, cells of concentrated and dilute salts are formed. 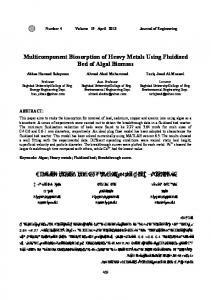 The disadvantage is the formation of metal hydroxides, which clog the membrane. Ultrafiltration: They are pressure driven membrane operations that use porous membranes for the removal of heavy metals. The main disadvantage of this process is the generation of sludge. Ion-exchange: In this process, metal ions from dilute solutions are exchanged with ions held by electrostatic forces on the exchange resin. The disadvantages include: high cost and partial removal of certain ions. Chemical Precipitation: Precipitation of metals is achieved by the addition of coagulants such as alum, lime, iron salts and other organic polymers. The large amount of sludge containing toxic compounds produced during the process is the main disadvantage. Phytoremediation: Phytoremediation is the use of certain plants to clean up soil, sediment, and water contaminated with metals. The disadvantages include that it takes a long time for removal of metals and the regeneration of the plant for further biosorption is difficult. Hence the disadvantages like incomplete metal removal, high reagent and energy requirements, generation of toxic sludge or other waste products that require careful disposal has made it imperative for a cost-effective treatment method that is capable of removing heavy metals from aqueous effluents. BIOSORPTION The search for new technologies involving the removal of toxic metals from wastewaters has directed attention to biosorption, based on metal binding capacities of various biological materials. Biosorption can be defined as the ability of biological materials to accumulate heavy metals from wastewater through metabolically mediated or physico-chemical pathways of uptake (Fourest and Roux, 1992). 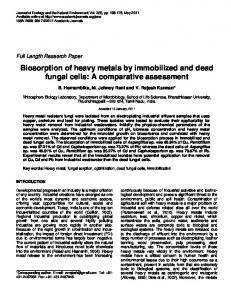 Algae, bacteria and fungi and yeasts have proved to be potential metal biosorbents (Volesky, 1986). 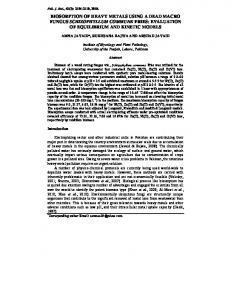 The major advantages of biosorption over conventional treatment methods include (Kratochvil and Volesky, 1998 a): • Low cost; • High efficiency; • Minimisation of chemical and lor biological sludge; • No additional nutrient requirement; • Regeneration of biosorbent; and • Possibility of metal recovery. The biosorption process involves a solid phase (sorbent or biosorbent; biological material) and a liquid phase (solvent, normally water) containing a dissolved species to be sorbed (sorbate, metal ions). Due to higher affinity of the sorbent for the sorbate species, the latter is attracted and bound there by different mechanisms. The process continues till equilibrium is established between the amount of solid-bound sorbate species and its portion remaining in the solution. 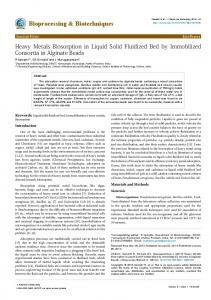 The degree of sorbent affinity for the sorbate determines its distribution between the solid and liquid phases. immobilization (Holan et al. 1993, Mah:!mn and Holocombe, 1992). Cross-linking: The addition of the cross-linker leads to the formation of stable cellular aggregates. This technique was found useful for the immobilization of algae (Holan et al. 1993). The most common cross linkers are: formaldehyde, glutaric dialdehyde, divinylsulfone and formaldehyde urea mixtures. Desorption: If the biosorption process were to be used as an alternative to the wastewater treatment scheme, the regeneration of the biosorbent may be crucially important for keeping the process costs down and in opening the possibility of recovering the metals extracted from the liquid phase. For this purpose it is desirable to desorb the sorbed metals and to regenerate the biosorbent material for another cycle of application. The desorption process should: • yield the metals in a concentrated form; • restore the biosorbent to close to the original condition for effective reuse with undiminished metal uptake and • no physical changes or damage to the biosorbent. While the regeneration of the biosorbent may be accomplished by washing the metal- laden biosorbent with an appropriate solution, the type and strength of this solution would depend on the extent of binding of the deposited metal. Dilute solutions of mineral acids like hydrochloric acid, sulphuric acid, acetic acid and nitric acid can be used for metal desorption from the biomass (de Rome and Gadd, 1987, Zhou and Kiff, 1991, Luef et.al. 1991, Holan et.al. 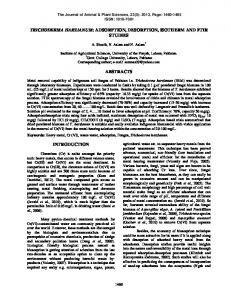 1993, Pagnanelli etal. 2002, Baiand Abraham, 2003). Polysulphone immobilized Rhizopus nigricans were subjected to Cr (VI) recovery experiments using 0.01 N solutions of mineral acids, salt solutions, alkalies, deionised distilled water and buffer solutions. The percentage desorption by various eluants is given in Table 2. A few experiments were conducted to desorb the metal ions from the loaded waste fungal biomass of Aspergillus species (Chandrashekar et al. 1998) as a function of HCl concentration in the case of iron, calcium and nickel. The results revealed that with increase in HCl concentrations, the desorption of the metal ions increased and at 5M HCI, complete removal of calcium and iron would be achieved while about 78% Nickel would be desorbed. The desorption of the adsorbed Hg (II) from the biosorbent - immobilized and heat inactivated Trametes versicolor and Pleurotus sajur-caju were studied in a batch system (Arica et al. 2003). 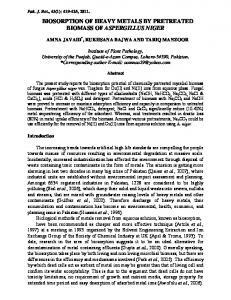 Hg (II) ions adsorbed onto the biosorbents were eluted with 10 mmol dm-3 HCl and the results showed that more than 97% of the adsorbed Hg (II) ions were desorbed from the biosorbents. 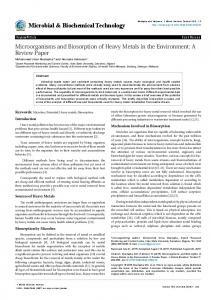 Effect of Pre-treatment on the biosorption of heavy metals: Metal affinity to the biomass can be manipulated by pretreating the biomass with alkalies, acids, detergents and heat, which may increase the amount of the metal sorbed. The bioadsorption capacity of autoclaved Mucor rouxii decreased as compared to the live fungus, attributed to the loss of intracellular uptake (Yan and Viraraghavan, 2000). Whistler and Daniel (1985) reported that the heat treatment could cause a loss of amino-functional groups on the fungal surface through the non-enzymic browning reaction. Aminofunctional groups in the polysaccharides contribute to the binding of heavy metals (Loaec et al., 1997). However, Galun et al., 1987 reported that Pencillium biomass pretreatment at 100°C for 5 minutes increased the biadsorption of lead, cadmium, nickel and zinc and the increase was attributed to the exposure of latent binding sites after pre-treatment. In the case of alkali pre-treatment, bioadsorption capacity of Mucor rouxii biomass was significantly enhanced in comparison with autoclaving (Yan and Viraraghavan, 2000). 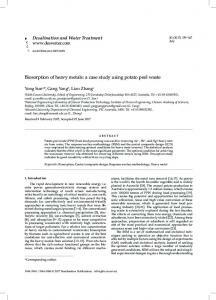 In a study by Galun et al. (1987), NaOH treated Pencillium digitatum also showed enhancement of cadmium, nickel and zinc biosorption. Removal of surface impurities, rupture of cell-membrane and exposure of available binding sites for metal bioadsorption after pre-treatment may be the reason for the increase in metal bioadsorption. 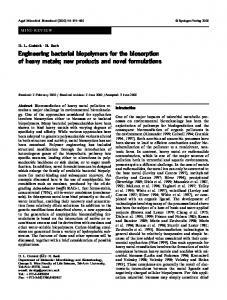 McGahren et al. (1984), Brierly et.al (1985) and Muraleedharan and Venkobachar (1990) showed that alkali treatment of biomass may destroy autolytic enzymes that cause putrefaction of biomass and remove lipids and proteins that mask reactive sites. The cell wall of Mucor rouxii was ruptured by NaOH treatment. Besides, the pre-treatment could release polymers such as polysaccharides that have a high affinity towards certain metal ions (Mittelman and Geesey, 1985; Loaec et.al. 1997). 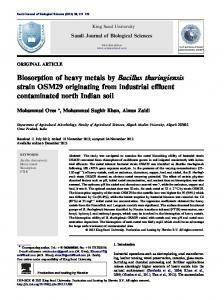 Acid pretreatment of Mucor rouxii significantly decreased the bioadsorption of heavy metals (Yan and Viraraghavan, 2000), which is in agreement with the observation of Kapoor and Viraraghvan (1998) in the case of A.niger. 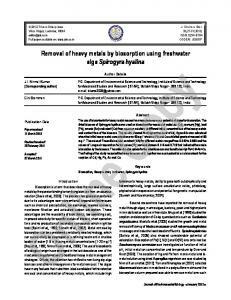 This is attributed to the binding ofH+ ions to the biomass after acid treatment may be responsible for the reduction in adsorption of heavy metals. The polymeric structure of biomass surface exhibits a negative charge due to the ionization of organic and inorganic groups (Hughes and Poole, 1989). 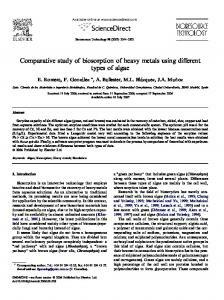 Bux and Kasan (1994) suggested that the higher the biomass electronegativity, the greater the attraction and adsorption of heavy metal cations. Thus the remaining H+ions on the acidic pretreated M.rouxii biomass may change the biomass electronegativity, resulting in a reduction in bioadsorption capacity. However, Huang and Huang (1996) reported that acid pretreatment can strongly enhance the adsorption capacity of Aspergillus.oryzae mycelia. In case of A.oryzae, live biomass after acid pre-treatment was directly used in bioadsorption of heavy metals instead of being autoc1aved and dried. The difference in results after a specific pretreatment may be attributed to the different strains of fungi used and whether the biomass was live or stead when it is used in biosorption of metal ions. For example; pre-treatment of A.oryzae by HClO4 increased the bioadsorption of lead, cadmium and nickel, but it was not the case for the species of R.oryzae (Huang and Huang, 1996). 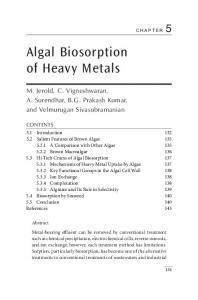 When non-viable biomass is used in the removal of heavy metals, alkali pretreatment is an effective method to improve the bioadsorption capacity for metal ions (Yan and Viraraghavan, 2000). Hence, the bioadsorption efficiency of dead biomass may be greater, equivalent to, or less than that of live biomass depending on the pre-treatment method applied. It is necessary to carry out more detailed studies to understand why enhancement or reduction in adsorption capacity occurs under specific pre-treatment conditions. CONCLUSION Biosorption is being demonstrated as a useful alternative to conventional systems for the removal of toxic metals from industrial effluents. The development of the biosorption processes requires further investigation in the direction of modeling, of regeneration of biosorbent material and of testing immobilized raw biomasses with industrial effluents. Due to the extensive research and significant economic benefits of biosorption, some new biosorbent materials are poised for commercial exploitation. REFERENCES 1. G. Rich, K. Cherry, Hazardous Waste Treatment Technologies, Pudvan Publishers, New york (1987) 2. 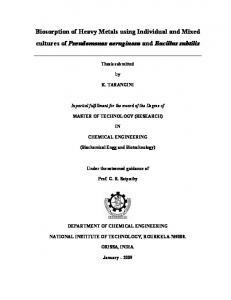 R.K. Trivedi, Pollution Management in Industries, Environmental Publications, Karad (1989) 3. B. Vole sky, Biosorbent Materials, Biotechnoi. Bioeng Symp., 16: 121-126 (1986) 4. C. Ercole, F. Veglio, L. Toro, G. Ficara and A. Lepidi, Immobilisation of microbial cells for metal adsorption and desorption. 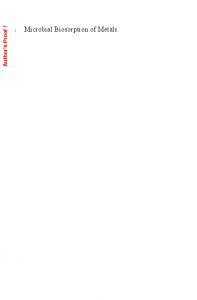 In: Mineral Bioprocessing II. Snowboard. Utah (1994) 5. 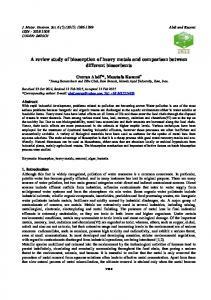 N. Kuyucak and B. Vole sky, Biosorbents forrecovery of metals from industrial solutions.